Despite being the greenest mode of transportation, biking is undeniably an unreliable way to commute especially if we take modern subway traffic, tube closings, line delays and weather conditions into consideration. Such hitches discourage urban bikers to adopt other not-so-green ways to reach offices or their respective destinations. Enter the Bicycle Barometer, a practical device that helps bikers take the right decision regarding the most suitable route to their workplace. Designed by Richard Pope, the gadget gathers weather and subway-related data to allow users to decide whether to cycle or take the train. 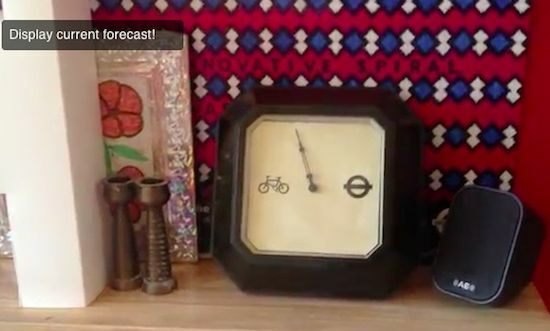 Made out of an old clock found at a flea market, the barometer relies on Nanode to keep a regular tab on the APIs of Transport for London’s line status, station status and the Met Office’s Datapoint and accordingly points to the tube if it’s pouring rain or the bike when it’s sunny. Pope has posted the code, instructions and design for those DIYers who want to make a Bicycle Barometer for their own.